Our Bosun's chair is the West Marine Deluxe model with 3" foam in the seat and numerous large pockets "D". We use our chair with a 4 way pulley system that allows one person to go up the mast un-aided. Using this technique I replaced all the standing rigging on the boat when we first bought her. 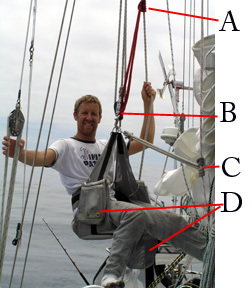 First, using one halyard (main or spinnaker depending if you want to work on the front or aft of the mast) raise the pulley system to the top of the mast. Next secure a second halyard - the safety - such that it has a clean run to the top of the mast on the same side as the first (Flipping a spinnaker halyard round the spreaders to the aft side is acceptable as it will not be moving). The Block at "B" has a one way ratchet switch which allows for hauling yourself then locking off after every pull. Turning the switch removes the ratchet, allowing descent. Note in the picture I have a red safety line "A" attached to the end of the pulley line such that if I were to let go for any reason it would lock off and catch my fall. I also have a second safety tether using the same slip knot "C" which runs up the second halyard, this is incase the first halyard should fail in any way. As I ascend, I raise the knots, as I descend I lower the knots. See the picture for a blow up on the slip knot that locks when pulled in a downward motion. Basically make a loop, go round the halyard and through the center of the loop 3 times then even out, make pretty and tight. Tip: When storing the 4way pulley system put a knot at the top block and a knot at the bottom block such that the lines will not be crossed the next time you use it.